Rachael earned her bachelor’s degree in Exercise Science and her Doctorate of Physical Therapy from Simmons College. Her clinical background was focused in the outpatient treatment of patients of all ages. She specialized in treating shoulder injuries especially post-op rotator cuff repairs. Rachael has always been an avid swimmer and competed for four years at Simmons College where she captained her senior season. Her swim career started at the Sterling Center swimming for the YNS Sharks. Professionally, Rachael aspires to use her knowledge of swimming and athletics to offer a new outlook on recovery. 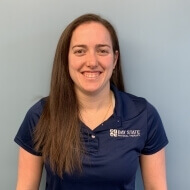 Outside of work, she has continued to share her love of swimming and her exercise science background to help teach swimming both lessons and competitively for the past two years. After living in the city she also has a strong love for all Boston sports, especially the Red Sox.